Aerial Skiing Is A Game Of Skill — And Strategy The Olympic sport is like gymnastics in the air, but in the final few rounds, aerialists can't use the same trick twice. Come go time, they have to figure out which trick to do, based on what their competitors have just done. 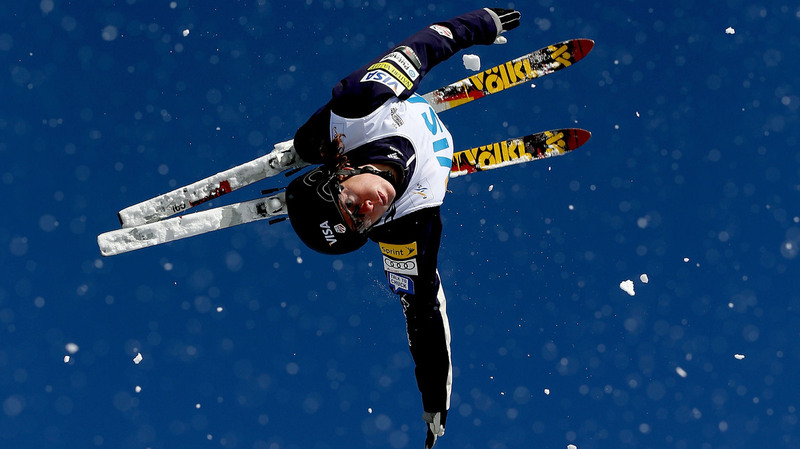 Emily Cook trains in aerials for the Visa Freestyle International in Park City, Utah, last February. 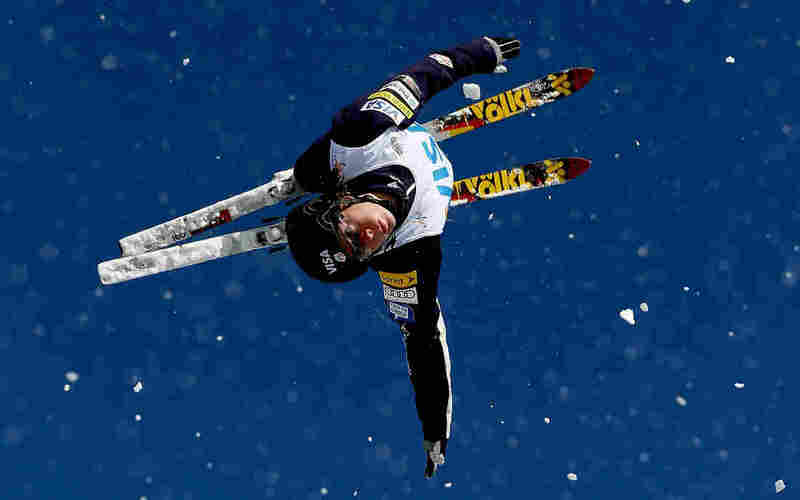 During the Winter Olympics, seeing an aerial skier perform is unforgettable. It's like gymnastics in the air. And, like gymnasts, aerial skiers get points for doing a harder routine and for sticking the landing. But there's a crucial difference between the two sports. In the final few rounds of aerials, you can't use the same trick twice. Sometimes, after seeing what the athletes before you have done, you have to change which moves you'll use in the very last seconds. The aerialists are in the air for mere seconds, but they do so many maneuvers that they land before you can say all their moves out loud. Everything happens so fast, and the moves are so complicated, that skiers and their coaches use shorthand lingo. At times, it sounds like a made-up children's language. There's the "double full, full double full," for example. Not to be confused with the "full, full double full." Ask an aerialist like Dylan Ferguson to translate and you can see why they use the shorthand. "I do three flips with five twists. So a back flip with two twists, a back flip with one twist, and a back flip with two flips — twists," Ferguson stumbles on the words as he explains. "I can't even say it," he says, laughing. This year, the strategizing has come into play big time. Emily Cook, who has been to two Winter Olympics, performs two variations on a triple twisting double back flip. When the time comes, she'll have practiced them so much that the moves are stored in her muscle memory. So the question becomes: Which trick to do? You can't just do your best move all the time. You have to plan exactly when to do your best move. Saving the hardest trick for last won't guarantee the best score. "When people are overperforming, sometimes you have to do your hardest jump first to make sure you are in the final round," says Todd Schirman, program director of the USA Freestyle Team. When one person performs a harder jump, everyone after that athlete reconsiders his moves. "So they step it up and do the correct jump to get themselves in the finals," Schirman says. Last weekend in Lake Placid, N.Y., at the last World Cup event of the season, Australian Laura Peel swapped tricks at the last minute. This is when it gets tricky for the other competitors. Standing at the top of a hill, Cook can't see what tricks the other skiers just completed. A series of coaches relay them up the hill to her. Then, moments before she's about to jump, the coach at the top might say, "Do the harder trick." Imagine a gymnast changing her routine five seconds before it starts. Cook says they train over and over again to swap tricks at the last minute. She decided to do her hardest trick in the second-to-last round; she desperately wanted to get into the finals. It was great, but not great enough. She took fifth in the round, one spot shy of moving on. Sometimes, strategy isn't enough, she says. That day, the Chinese team dominated. It performed the hardest jumps and nailed them every time. That kind of perfection is hard to outstrategize.